Ho‘ola Ka Makana‘ā—a land-based education program—is a collaborative cultural ecology, outreach, and stewardship project at the Ka‘ūpūlehu dryland forest on the lee of Hualālai mountain. This 70-acre preserve, located in the mauka area of the Ahupua’a of Ka‘ūpūlehu, was originally fenced, tended and managed by the Dryland Forest Working Group in the late 1990s with HFIA (Hawai`i Forest Industry Association), as a demonstration and science research project to protect rare native plants and learn more about these disappearing ecosystems. That early vital work has evolved into a collaboration mauka-makai, with discerning stewardship learning opportunities for a wide range of groups and individuals including: youth, high school, graduate students, community, lineal descendants cultural practitioners, educators and scientists. The program name means “Healing the Place Budding Up Out of the Lava” and represents the hard place of raising awareness and restoring a severely impacted ecosystem. At the same time it also recognizes the “hard place” our communities face being able to connect to special legacy lands and places that rejuvenate the spirit. Missing from the above video due to travel is another treasured staff member and “culture keeper” as well as site manager, Wilds Pihanui Brawner. Mahalo nui to the OHA multi-media team and editor for this work, and for the ‘Āina grant to support this effort and multi-media journey. Ho‘ola Ka Makana‘ā is an `Aina Ulu land-based bio-cultural education project of Kamehameha Schools. Since the the ‘Āina Ulu component began in 2002 under the direction of Yvonne Yarber Carter over 7,700 volunteers (thru 2016) have given something of themselves to revitalizing this special dryland forest through outplanting, weeding, and trailbuilding. Science partners provide important collaborative management and educational facets to ecosystem resilience and monitoring. Since 2002 the program and staff has expanded as described below and the next generation of stewards have joined the collective kuleana to grow together with the forest. Wilds Pihanui Brawner became the Site Manager in 2008, heading up the restoration strand. Ku‘ulei Keakealani strengthens mauka-makai connections; tending to and sharing ‘ike kupuna—historical and ancestral knowledge. “Uncle” Keoki Apokolani Carter directs the Mea Lāʻau component and provides multi-generational guidance and training. Lehua Alapai took on the role of Outreach Coordinator in 2017 as programs expanded and Yvonneʻs work shifted to coordinating the programs, resource development, multimedia and grant support. HFIA is the fiscal manager of the programs with the valued support of Heather Simmons, Executive Director of the non-profits HFI and HFIA. Information about the four programs that work together can be found below, including the vision and mission statements used as a guiding light. E ola ka mālamalama o Ka‘ūpūlehu. Life to the radiancy of Ka‘ūpūlehu (Kaulupūlehu). Our mission is to tend, honor, and grow a place of peace and safety for the dryland lama forest community of Ka‘ūpūlehu. We strive to carry the “torch” and “light” and promote the rigorous learning that the name “lama” suggests. 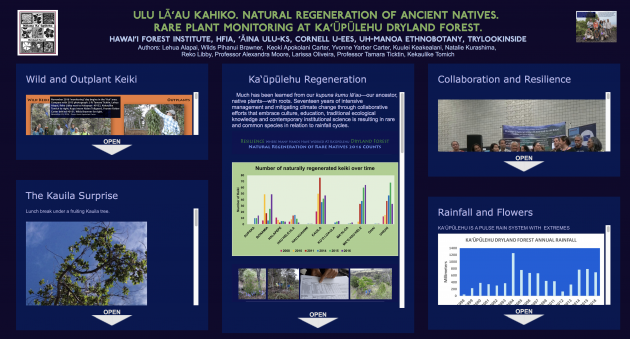 At the 2017 HCC Hawai‘i Conservation Conference, Ka‘ūpūlehu submitted an e-poster about monitoring collaboration titled “Ulu Lā‘au Kahiko. Natural Regeneration of Ancient Natives”. This e-brochure documents the positive results from efforts to mitigate climate change through increasing canopy and ground cover shade by planting natives. Mahalo to support from IUCN (International Union for the Conservation of Nature) and WCC (World Climate Change Fund) which made this electronic multi-media brochure and its presentation at HCC a possibility. This format allows Ka‘ūpūlehu to reach many more people and reduce its carbon footprint. Another important Ka‘ūpūlehu collaboration has been with the PICCC (Pacific Islands Climate Change Cooperative) project. This diverse, extended ‘ohana created a seasonal calendar and educational portal as one of the PICCC TEK (Traditional Education Knowledge) sites. 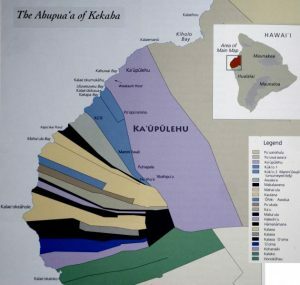 The following links will connect you to a few of the many resources used to better understand, plan and manage the lands of Ka‘ūpūlehu. Many are inspired by the lands of Ka‘ūpūlehu. One example is Lihau Hannahs Paik who interned at the forest in 2003. 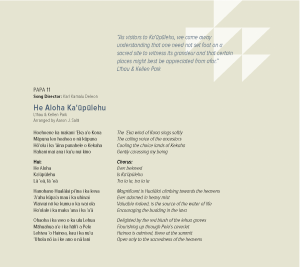 In 2012, Lihau and husband Kellen Paik composed a beautiful tribute to these lands for the Kamehameha Schools Song Contest. The preshow program featured several sites with mālama ‘āina programs, including Ka‘ūpūlehu and several other ‘Āina Ulu outdoor learning sites including Waipā, and Heeia fishpond. That show can be viewed below. Eighteen minutes into the video begins a two-minute clip on Ka‘ūpūlehu at Hainoa with Lihau and Kellen to the forest at Ho‘ola Ka Makana‘ā with Uncle Keoki Carter, Aunty Yvonne and Wilds Pihanui Brawner. The beautiful song to the left by Kellen and Lihau written for the 2012 Kamehameha Schools Song Contest can be heard at 2012 Songs timeline 02:11:11 to 02:15:35. Hannah Kihalani Springer is deeply connected to the lands of Ka‘ūpūlehu both by ancestral lineage and personal kuleana. As a founding member of the Dryland Forest Working Group, she toiled the dryland forest lands in the late 1990s when fencing and restoration of the 70-acres of Ho‘ola Ka Makana‘ā began. She gives voice to cultural and geologic history of this ‘āina so that connections not be forgotten. This video is from the 2012 Dryland Forest Symposium in Kona. And the following videos from the 2011 Hawai‘i Conservation Conference Forum feature Ka‘ūpūlehu: Forest as ‘Ohana—Culturally-based Forest Restoration in Hawai‘i. 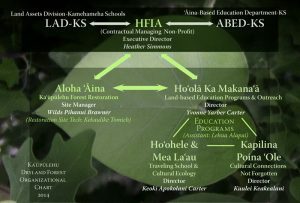 Culturally-based Forest Restoration in Hawai‘i—Forest as ‘ohana. “Aunty Yvonne” believes the hope for the future of our native forests is the guiding principle of kuleana and the saying, “Take care of the land, and it will take care of you.” This approach to restoration entwines: respect, aloha, sharing, diversity, partnerships, cultural legacy, protocols of behavior and forest as family. Cultural ecology needs requires patience and respect. “Uncle Keoki” has grown into a relationship with the forest that embraces and entwines his old style rural Hawaiian upbringing and social values with a formal education as a certified teacher, and advanced degree in Wood Science. Striving first to be true to his cultural worldview and commitment to the land, science learning provides an added lens of understanding. Looking at restoration within the time frame of elder trees, he reminds young stewards to the forest that “good things take time”. Drew Kapp, UH, Hilo and Hawai‘i Community College, Geography & Environmental Studies Dept. The extended family—efficacy, and sustainability of stewardship learning opportunities and partnerships with restoration sites that value cultural legacy. Working and learning journeys or huaka‘i “represents one of the most valuable components of our courses.” Drew Kapp has done much to expand the extended ‘ohana of volunteers at many restoration projects on Hawai‘i island. Wilds Pihanui Brawner—Site manager, DHHL Kealakehe and Ka‘ūpūlehu Dryland Forest. Cultural ecology as an approach to site management, and why nurturing a culture of volunteers, training interns and youth is vital to restoration efforts. Internship opportunities helped to prepare Wilds for his present work as a dryland forest site manager. Pua Herron-Whitehead, HYCC Americorps intern. The importance of learning opportunities in an ‘ohana setting. Perspective of a young steward being trained and employed in a cultural ecology setting, that was made possible by internship funding and programs.